Custom Vibration Isolation Mounts - Vibra Systems Inc. 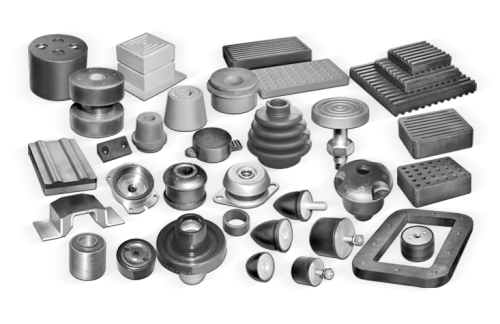 Custom Vibration Isolation Mounts, Pads, Absorbers, and More! Moulding of any shape of products with any rubber compound. Hot and cold bonding of any material with any rubber compound. Special vibration isolation mounts for diesel-generator systems. Gaskets, diaphragms, partitions, pads, blocks, and shims. Machinery mounts for any load of up to 250,000 lbs. Bearing pads for any size for loads up to 15,000 psi. Tuned mass absorbers (vibration damper), cab mounts for automotive industries. Hangers, springs, and seismic mounts for construction industries. Custom, stainless steel, vibration isolation mounts for marine and offshore drilling platforms, and for the food, pharmaceutical, and chemical industries. Many other products designed to customer specifications. Our custom products are manufactured with special regard for client specifications based on the intended use of those products. Both consulting and design are performed with careful consideration for industry standards, individual needs, and performance requirements. We have a fully qualified engineering team ready and able to assist you in preparing custom shock and vibration isolation mounts, absorbers, and other solutions to address your specific operational requirements. VibraSystems Inc. designs and manufactures products for maximum performance and efficiency, along with a long service life while products are used as recommended. We guarantee excellent-quality products that are free from defects, with recommended usage as provided. The variety of isolator types and ranges in our product line can offer protection for virtually all types of equipment. What sets VibraSystems Inc. apart from others is our ability to provide fast, custom solutions to our customers. Our in-house engineering team will design and manufacture parts or systems according to your drawings and specifications, and will work with your engineering and procurement departments to make any necessary changes to the products for final approval of the prototypes. This is the case even when only small quantities are required. VibraSystems Inc. is committed to providing the technical assistance necessary to support the correct application of our products, with careful consideration for industry standards, individual needs, and performance requirements. Whether you need a specific vibration damper or a unique mount, we are committed to working with you to create it! Contact us anytime to begin work on your custom orders!